The lavishly illustrated book Posters for the People: Art of the WPA amasses nearly 500 of the best and most striking posters designed by artists working in the 1930s and early 1940s for the government-sponsored Works Progress Administration, or WPA. Posters for the People presents these works for what they truly are: highly accomplished and powerful examples of American art. All are iconic and eye-catching, some are humorous and educational, and many combine modern art trends with the techniques of advertising and commercial designs. Roughly 125 posters in this collection were never cataloged by the federal government and represent exciting new additions to the WPA Living Archive, the most comprehensive online database of WPA posters known to exist. This ever-growing virtual archive will be launched in September 2008 and will bring to light countless posters that haven't been seen by the public in more than 70 years. This book is the #1 Bestseller in the Antique & Collectible Poster category on Amazon. Buying it direct from us helps us keep this project alive. 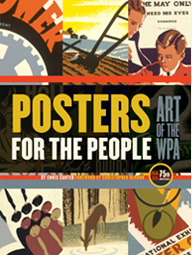 All royalties from the sale of this book support the WPA Living Archive and its ongoing effort to preserve the legacy of the WPA posters by putting this national treasure back into the hands of the American people.